Livliga® Live Vibrant Blog: Crisp or Crumble- is there a difference? The other night a friend of ours made a “crumble” for dessert. We were in New York. It seemed a lot like the “crisp” I make so I asked him what was in his crumble. The ingredients were identical to what I put in my crisp. This then launched a discussion about the difference between a crisp and crumble. Interestingly, we have a perception that there is a difference. Depending on who you talk to the differences are defined by which one includes nuts, oats or biscuit dough. Funnily, also depending on who you talk to, the differences can be the opposite of what you think. There is no clear distinction. Not even by country or region. Simply, it is based on your own frame of reference and tradition. For me, I grew up using the term “crisp” for a fruit based dessert that was topped with a flour, butter, oat and brown sugar mixture and baked. 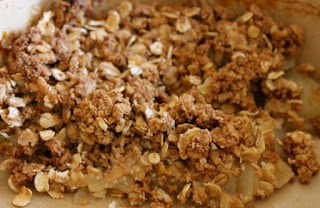 A “crumble” was more like a streusel topping which had more sugar and no oats. 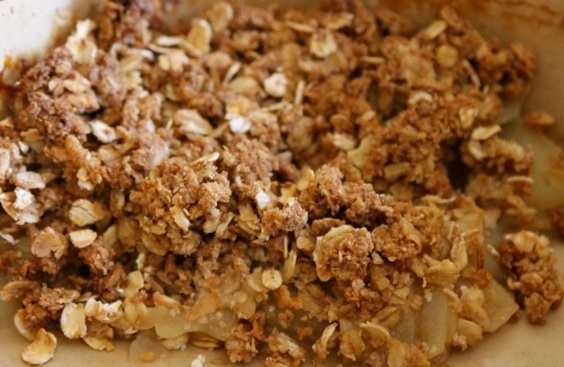 Other fun names that are similar to a crisp or crumble are slump, grunt, buckle and cobbler. You may just have to try them all! What I like about a crisp is that it is more fruit and a lot less crust or topping. In my pursuit to keep making everything a little bit healthier, I have updated my crisp to be gluten free. The recipe is below. 1. Combine first six ingredients. Mix by hand or in a food processor until moist and crumbly. 2. Place apples in a large bowl; sprinkle with lemon rind, lemon juice and toss well. Next sprinkle with granulated sugar and remaining teaspoon of cinnamon; toss until mixed well. 3. Spray a 9x9 inch or 7x11 inch baking dish with cooking spray. Place the apples in the dish. Top with the oat mixture. 4. Bake at 400 degrees for 15 minutes. Then reduce heat to 350 degrees for an additional 40 minutes, until apples are tender and the topping is crisp and brown. Serves 8. Calories per serving: 290.